After spending hours and hours trawling through consumer reports, gathering the thoughts and reviews of real customers and putting microwaves to the test we have concluded that the Sharp R959SLMAA is the best combination microwave for most people. If you want to the absolute and can spend a little more on an upgrade we recommend the Panasonic NN-CF778SBPQ. Combination microwaves are an ‘all-in-one’ type of machine. Besides having the functions of a standard solo microwave, combination microwaves have built a built in grill and convection oven. The best combination microwave is capable of crisping, browning, baking and roasting, enabling you to cook a much wider variety of foods and more complex dishes than a typical solo model. If you cook a lot and find yourself always needing some extra oven space, a combination microwave would be perfect for you. As you might expect, all these features make ‘combi’s’ the most expensive type of microwave. That being said, prices start from around £90 which isn’t earth shatteringly expensive, but if you want more features and better quality, expect to pay more. If you’re in the market for a new microwave you’ll want to think about what features you’ll need. Combination microwaves are the most versatile kind but that doesn’t necessarily mean you should rush out and buy one when a solo or microwave grill will work for you. So let’s look at the pros and cons. If you just want a microwave for reheating or defrosting and maybe cooking a ready meal, a combination microwave isn’t for you. Save yourself some money and consider a solo microwave or a microwave with grill. When it comes to combination microwaves there aren’t as many options on the market when compared to basic models. But that’s not to say there isn’t plenty to choose from. 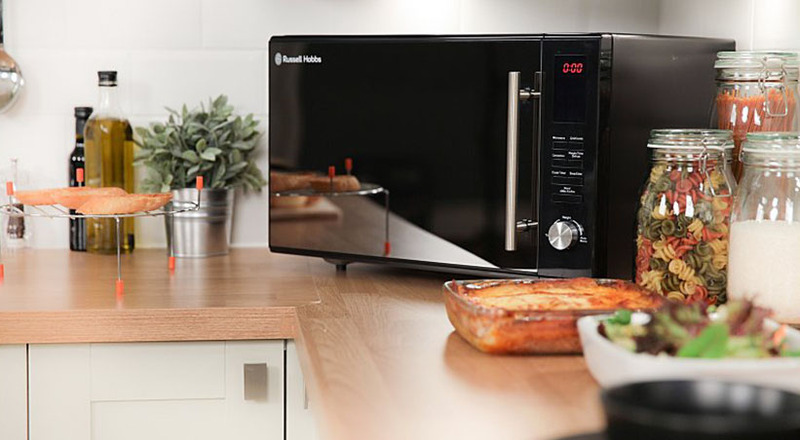 If you’re investing in a combination microwave you’ll want something quite powerful – we’d recommend 900 watts or upwards. Again,if you’re looking for a combi, we’re assuming you’ll be doing some pretty serious cooking so in this case we’d say bigger is better and recommend you choose at least a 27 litre capacity. How you’ll would use it – if you’re going be cooking with it regularly and have a large family then a larger capacity might be best. If you’ll only be using it occasionally as a back up then go smaller. Where you’ll put it – if you’ve got plenty of space in your kitchen to accommodate a larger machine then you might consider one. On the other hand, it you’re tight for space you might be forced into buying a smaller capacity. 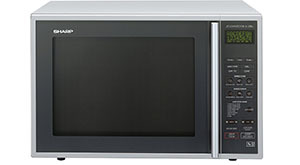 Combination microwaves by their nature are pretty feature heavy and will do most jobs. Some however, come with extra features like built in steamers or a rotisserie, if these aren’t feature you want or need, choose a lower spec model and save yourself some money. While style should come secondary to how well a machine works, it would still be nice if your microwave looks good in your kitchen, so the look if it might be worth considering. Some models come in different colours to help with that. There are many brands that make microwaves. Russell Hobbs, Panasonic, Daewoo, Samsung – the list goes on. We would always recommend you buy your kitchen equipment from a brand you know and trust. They usually have a solid 12 month guarantee and sometimes they might even extend them to 3 or 5 years. Because combination microwaves are the most versatile and full of features, they are the most expensive. That’s not to say there are overly expensive. At the time of writing, our budget option is around £120 which considering the versatility you get, isn’t a bad price at all. The cheapest price isn’t always the best price though. Make sure the model you’re considering does everything you want it to. If it doesn’t, consider upgrading. And likewise, the most expensive machine is a waste of money if you don’t use it to it’s full potential. If the model you’re looking at has more features on it than you’ll use, why not downgrade and save yourself some money? 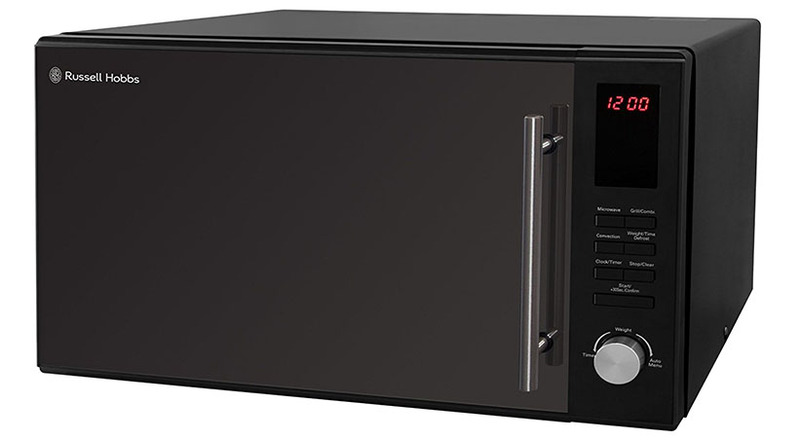 The Sharp R959SLMAA is a combination microwave that has a huge 40 litre capacity – easily big enough to fit a 10lb turkey at Christmas. It has 900 watt of microwave power, a 1400 watt quartz grill and convection oven. Along with this you get internal shelves so you can cook multiple items at the same time. Featuring touch controls for all of it functions the Sharp has 5 power settings and 8 auto-cook menus. You also have a dual cooking feature so for example you can use the microwave power with the grill to cook a jacket potato with crispy skin in around 20 minutes. Firstly, the Sharp R959SMLAA is has one of the biggest capacities on the market, you can fit so much into it. The grill is fantastic, you can cook several pieces of toast and browning is even. It roasts really well too with a full chicken coming out brown, juicy and tasty. The microwave cooks evenly, heat is consistent and you won’t get cold spots when cooking microwave meals or reheating last night’s pizza. It looks really nice and the stylish control panel is well laid out and easy to use so you’ll get used to using it in no time. As nice as it is to have a big capacity, all that space has to go somewhere. This is a big machine so if you’re stuck for space you might want to choose a different microwave. Some users have said that it looks quite imposing on their kitchen. Also there is no clock when the microwave is in standby mode. We’re not sure why Sharp decided to do that but a clock is a handy tool to have in the kitchen and many people rely on having the clock on their microwave. This model doesn’t have one. The Sharp is loved by Which? who went as far as to say there is absolutely nothing about it and awarded it a Which? Best Buy. At the time of writing it scores well on Amazon.co.uk with a rating of 4.6 out of 5 stars from over 180 reviews. Considering the size, features and the quality of cooking and at a cost of less than £200, we believe the Sharp R959SMLA is the best combination microwave for most families. 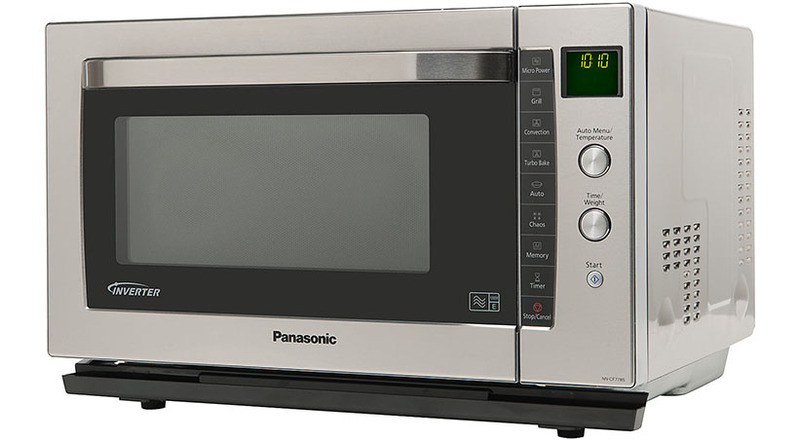 The Panasonic NN-CF778SBPQ is a flat bed, 27 litre capacity 1000 watt combination microwave. The flat bed design means you can fit larger dishes into the machine. Its 1000 watts of microwave power combined with it 1,300 watt grill with 3 settings and excellent convection oven cooks a whole host of foods quickly and evenly, leaving it moist and delicious. We absolutely love this machine and we for us, the the best combination microwave we teste. Even beating out models twice it’s price. This Panasonic’s auto-defrost is incredible and the manual settings are just as good. Both settings defrost food evenly so you won’t cook your mince on the outside and leave it frozen in the middle when you meant to just thaw it. The microwave itself cooks food quickly while retaining moisture so your lasagna isn’t going to curl up and go hard or brittle around the edges. It’s convection oven is simply brilliant so you can bake, roast and do everything you can do in a conventional oven with ease. And the grill is good too. Everything works brilliantly individually and you can also combine the microwave, grill and oven to create the perfect meals. The programming settings are intuitive and easy to use. The automatic programs are a breeze to select and if you’re feeling adventurous and want to to the multi sequence cooking and combine the three powers, this is simple too. It features a drop down door too instead of the standard side opening door, this provides the perfect surface on which to place hot dishes as you remove them from the microwave. Seriously, this microwave does everything that it;s meant to really well. The only slight downside is that it does tend to lose a bit of power after continuous use so if you’re cooking multiple dishes one after the other, you may need to allow a little more cooking time. With that said, this isn’t a problem unique to this machine, it happens on all kinds of microwaves. This machine scores very highly with consumer reports and everyday users. “This Panasonic combination oven impressed us in microwave and convection mode and is especially good at defrosting. Having read this review back, it looks like we’re actively trying to sell this microwave and that is not our intention. All reviews we write are as balanced as possible. But sometimes, you come across a product that is simply brilliant and the Panasonic NN-CF778S is brilliant. At around £250 it is more than twice the price of the Russell Hobbs but for us, it’s by far the best combination microwave if you’re looking for an upgrade. Combination cooking feature enables you to combine microwave energy with the grill and fan assisted oven. This is another very good looking combination microwave from Russell Hobbs. It’s a 900 watt machine and has a 30 litre capacity so it’s plenty powerful and big enough to cook a variety of different dishes making it suitable for most families. The convection (fan assisted) oven works in exactly the same way as a conventional oven so you’ll never run out of oven space. Another handy feature is the microwaves’ combination cooking ability. This allows you combine the microwave energy with the grill and convection oven so you can cook, crisp and brown, roast and bake. Perfect for cooking more complex dishes in one appliance. The 31.5cm turntable is big enough to accommodate a large dinner plate. Plus, the turntable is removable and the stainless steel interior makes it easy to clean. The size is a big benefit of this Russell Hobbs RHM3003B. It’s 30 litre capacity and 31.cm turntable makes it big enough to cook a whole host of foods with one user saying she ‘can easily feed her family of five with it’. It reheats, defrosts and cooks food quickly thanks to its 900 watts of power and once you get used to it, it’s pretty simple to use. Many users say the fan assisted oven is fantastic. It heats up quicker than a conventional oven and cooks food quicker too, making it a more energy efficient alternative. As with other Russell Hobbs models, the stylish reflective door is a bit hard to see through when cooking which means you’ll have to keep opening the door when you want to check on your food. Also, the combination cooking instructions aren’t very detailed but with that said, many users have stated that the menus are very intuitive and once you get used to them, it’s a very easy machine to use. Some users have also complained about the build up of condensation inside the machine after use. While it’s not a lot, it still has to be dried up. The funny thing is though that their readers – people who actually use this microwave every single day, rate it much more highly. Scoring it 8.9 out of 10 from 51 reviews. It scores highly on other shopping sites too. On Amazon.com (at the time of writing) it scores 4.2 out of 5 stars from more than 230 reviews; And Google Shopping scores it 4.4 out of 5 stars from more than 240 reviews gathered across all of the major shopping sites. When you consider the cost (around £120 at the time of writing), we think the Russell Hobbs is a feature packed combination microwave that delivers excellent value for money. Despite not being rated very highly by some consumer reports and websites, everyday users of this machine really like it. In our opinion it’s the best combination microwave if you’re on a budget.